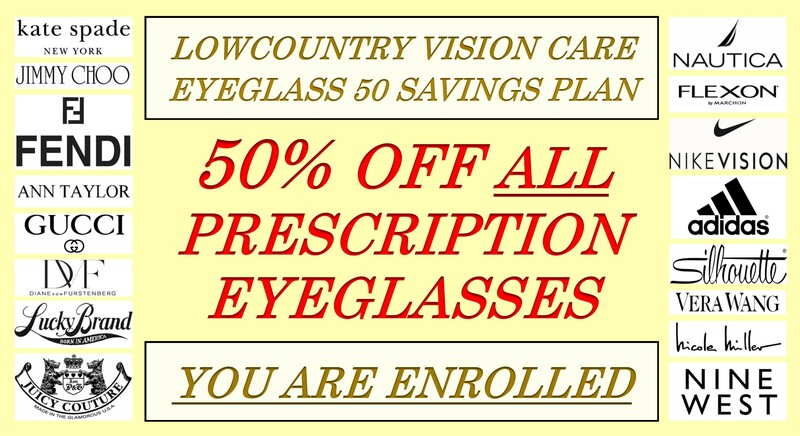 Dr. Smith and Lowcountry Vision Care are now offering local communities, organizations and select groups, enrollment into our Eyeglass 50 Savings Plan. If you have received an enrollment invitation by mail you may visit our optical showroom anytime to start your membership. If your community, organization or large group has an interest in our Eyeglass 50 Savings Plan, please contact our office manager Kay Wadman for specific requirements and details. The Eyeglass 50 Savings Plan is a limited enrollment offering which will be closed once our membership goal is met. *** Due to retail vendor agreements Maui Jim, Bolle, Serengeti, Adidas, Rudy Project and Costa Sunglasses are not discountable.